FRAMINGHAM, Mass., August 3, 2017 – Worldwide revenues for the augmented reality and virtual reality (AR/VR) market are forecast to increase by 100% or more over each of the next four years, according to the latest update to the Worldwide Semiannual Augmented and Virtual Reality Spending Guide from the International Data Corporation (IDC). Total spending on AR/VR products and services is expected to soar from $11.4 billion in 2017 to nearly $215 billion 2021, achieving a compound annual growth rate (CAGR) of 113.2% along the way. The United States will be the region with the largest AR/VR spending total in 2017 ($3.2 billion), followed by Asia/Pacific (excluding Japan)(APeJ) ($3.0 billion) and Western Europe ($2.0 billion). But then things get interesting as APeJ jumps ahead of the U.S. in total spending for two years before its growth rate starts to slow in 2019. The U.S. then pushes back into the top position in 2020 driven by accelerating growth in the latter years of the forecast. Meanwhile, Western Europe is expected to overtake APeJ for the number 2 position in 2021. The regions that will experience the fastest growth over the 2016-2021 forecast period are Canada (145.2% CAGR), Central and Eastern Europe (133.5% CAGR), Western Europe (121.2% CAGR) and the United States (120.5% CAGR). Within the regions, the industry segments driving AR/VR spending start from roughly the same place, but then evolve quite differently over time. The consumer segment will be the largest source of AR/VR revenues in each region in 2017. In the United States and Western Europe, the next largest segments are discrete manufacturing and process manufacturing. In contrast, the next largest segments in APeJ in 2017 are retail and education. Over the course of the forecast, the consumer segment in the U.S. will be overtaken by process manufacturing, government, discrete manufacturing, retail, construction, transportation, and professional services. In APeJ, the consumer segment will remain the largest area of spending throughout the forecast, followed by education, retail, transportation, and healthcare in 2021. Consumer spending will also lead the way in Western Europe, with discrete manufacturing, retail, and process manufacturing showing strong growth by the end of the forecast. "The consumer, retail, and manufacturing segments will be the early leaders in AR & VR investment and adoption. However, as we see in the regions, other segments like government, transportation, and education will utilize the transformative capabilities of these technologies," said Marcus Torchia, research director of IDC Customer Insights & Analysis. "With use cases that span both AR & VR environments, we see a significant opportunity for companies to re-cast how users interact in business processes and everyday tasks." "Augmented and virtual reality are gaining traction in commercial settings and we expect this trend will continue to accelerate," said Tom Mainelli, program vice president, Devices and AR/VR at IDC. "As next-generation hardware begins to appear, industry verticals will be among the first to embrace it. They will be utilizing cutting-edge software and services to do everything from increase worker productivity and safety to entice customers with customized, jaw-dropping experiences." The industry use cases that will attract the largest AR/VR investments are also expected to evolve over the five-year forecast. In 2017, the largest industry use cases will be retail showcasing ($442 million), on-site assembly and safety ($362 million), and process manufacturing training ($309 million). By the end of the forecast, the largest industry use cases in terms will be industrial maintenance ($5.2 billion) and public infrastructure maintenance ($3.6 billion), followed by retail showcasing ($3.2 billion). In contrast, the consumer segment will be dominated by AR and VR games throughout the forecast, with total spending reaching $9.5 billion in 2021. The use cases that will see the fastest growth over the forecast period are lab & field (166.2% CAGR), therapy and physical rehabilitation (152.0% CAGR), and public infrastructure maintenance (138.4% CAGR). 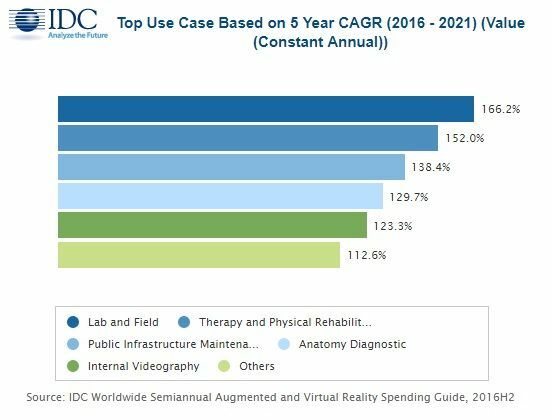 Spending on VR systems, including viewers, software, consulting services, and systems integration services, are forecast to be greater than AR-related spending in 2017 and 2018, largely due to consumer uptake of hardware, games, and paid content. After 2018, AR spending will surge ahead as industries make significant purchases of AR software and viewers. The Worldwide Semiannual Augmented and Virtual Reality Spending Guide examines the AR/VR opportunity and provides insights into this rapidly growing market and how the market will develop over the next five years. Revenue data is available for eight regions, 12 industries, 26 use cases, and eleven technology categories. Unlike any other research in the industry, the comprehensive spending guide was created to help IT decision makers to clearly understand the industry-specific scope and direction of AR/VR expenditures today and in the future.